When I decide to do something, I do that thing, and I do the hell out of it. As previously mentioned, I’ve been taking a lot of baths lately, and have been increasingly discontented with The Shower Door Situation. I suspect this is somewhat of a religious debate – the shower door lovers v. the shower curtain lovers – and I come down firmly, resolutely, upon the curtain side. They’re softer, prettier and less intrusive. 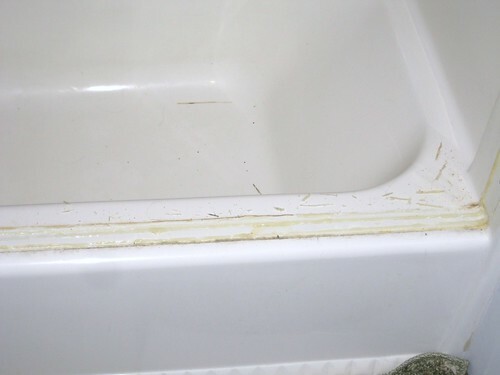 Shower doors are noisy, usually unattractive, make it harder to clean the tub and make bathing the dogs nearly impossible. One cannot sit on the edge of the tub to shave one’s legs or soak one’s feet. There was no room for a refreshing beverage to my left. Tonight, we bought a shower curtain rod and I was off to the races. I went after that sucker with a drill and a knife and 20 minutes later, it was out. Ugh. 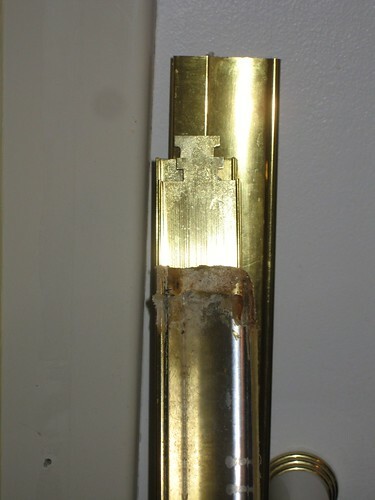 I am so not a brass/gold person – I like nickel, bronze and silver. Ahhh. So much better, right? Roomier, more open. We’ll address the pink and blue paint (with matching floral border) in a future home renovation frenzy. Also, pretend I remembered to move all the stuff off the shelf at the left. I was left with a metric honkload of caulk and adhesive lying around, so I went at it with a will. There was a long time when I was never without that knife. 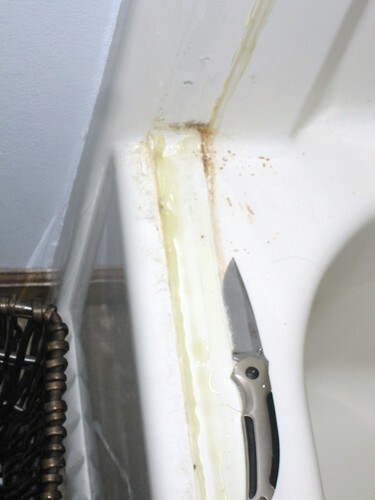 But as my jobs have become decreasingly outdoorsy, the knife started staying behind. The other day, a co-worker asked me if I had a knife. “Um,” I said, my hand reflexively reaching for my right back pocket, even knowing it wasn’t there, “sorry.” I’ve been carrying it since then, but it’s largely unnecessary. Alas. Meanwhile, back at the tub. I figured it would smell, but I was wholly unprepared for what it smelled like. It smelled like feet. Feet that had been cooped up in wet old boots for a month. Feet that hadn’t been bathed in a century. Let us speak no more of that unpleasantness. On a wholly unrelated note, the guy who taught me how to shoot (formerly a drill sergeant in the Marine Corps, now a Leather Daddy in Seattle) would be so proud: I keep my finger off the trigger – even when that trigger is on a power drill. There’s still a bunch of caulk remnants that will never come off, and mildew that will require Much Scrubbing, but the awful doors are gone. 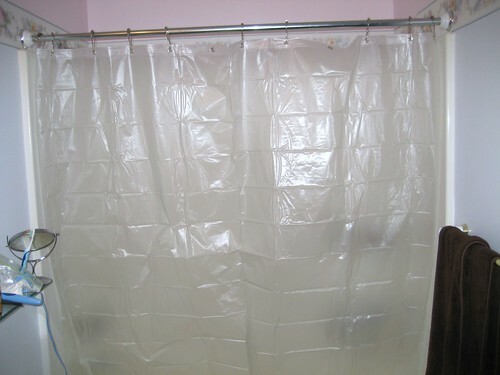 Also, I can’t find my damn outer shower curtain. I looked everywhere, emptied out every box in the basement, pawed through closets, nothing. I love that curtain – white with embroidered leaves and neat latticework at the top. That bugs me. Ah well. 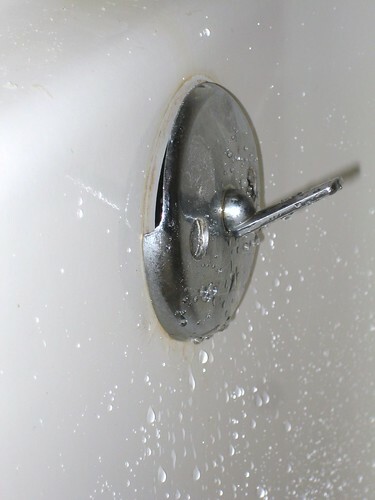 I also took the opportunity to implement my favorite bathtub hack – flipping the overflow drain over, so I get a couple more inches of water to hang out in the tub. It’s a quick and easy thing to do, but also requires the flipper thingie to be upside-down and operate so that down is closed, up is open. I can live with that if I get three more inches of hot water. And now, I am off to scrub the foot unpleasant smell off the edges so I may bask in the new tub – even though I am out of Epsom salt, boo. Wow, look at you go! 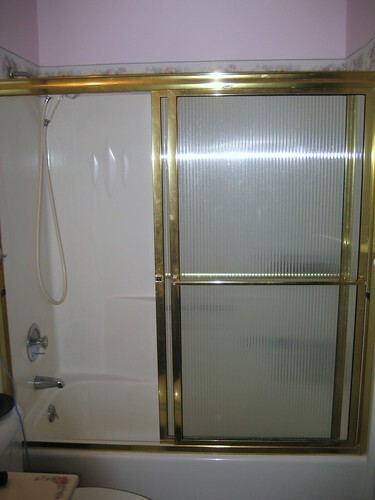 I had a similar experience once upon a time, as I am a fellow shower-door-hater. There’s nothing so awesome as getting rid of the blasted thing! … And just think, you can create some seriously fun style with a shower curtain! 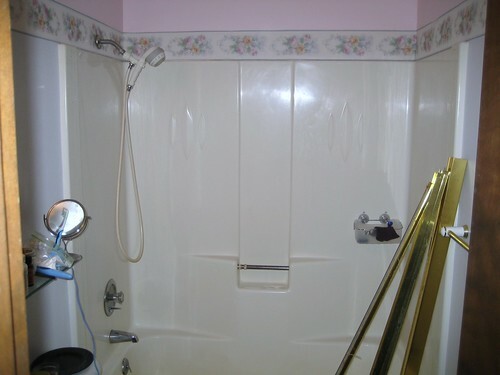 Shower doors are so limiting… and totally UNcreative! We had a set of those when I was growing up! Was glad when they left. I started hating them when I was very young and they wouldn’t let me out once. Trapped in the shower! And they do make you feel trapped! I think you made a great decision with this one!